A strip of land situated along the Malabar coast, better known as God's Own Country...where else but Kerala. Well known for its backwaters, abundance of seafood and spices, Kerala is also famous for its cuisine, notably the Onam sadya that can feature up to 28 dishes, all vegetarian. Spices used in Kerala food include pepper, cumin, coriander seeds, dry chillies, cloves, cinnamon and cardamom, among others. Coconut is used extensively as it is what gives texture and flavour to the food. Depending on the recipe, it could be grated or crushed coarse, ground fine, cut in thin slices and fried before being added to meat or desserts or the milk extracted and used to thicken gravies. Shallots, ginger, garlic and curry leaves are the other ingredients that form the base of a good Kerala dish. Coconut oil is the preferred medium of cooking. 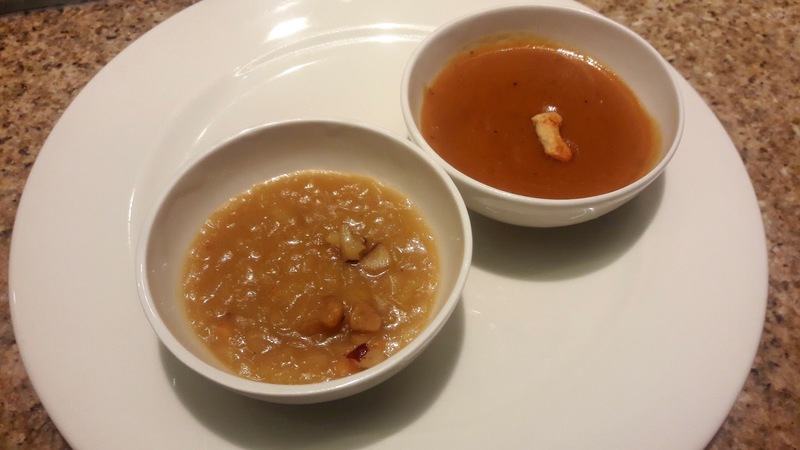 Kokum is the de facto souring agent though tamarind is also used extensively. Vishu, the new year for Kerala Hindus, is celebrated in the month of April. Gourab Pattanayak, chef-de-cuisine at Spice Haat, Hyatt Regency Chennai is helping Chennai folks celebrate Vishu with a menu that showcases popular dishes from Kerala at the Kerala Food Festival. 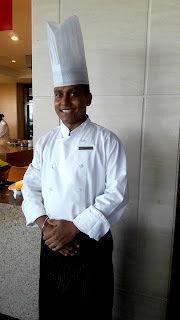 He's from Calcutta but has mastered the flavours and nuances of the Kerala cuisine and cooks like a native!! Two drinks were served - Pineapple Breeze and Sparkling Coconut. Both drinks were refreshing, in fact we got so into the spirit of Kerala that we convinced ourselves that the milky white coconut drink was a tad fermented. Of course it wasn't! There was also chakka varatti, a halwa made of jackfruit and jaggery. Appetisers were served at the table - pazham pori - crisp batter-fried bananas that are extremely popular all over Kerala, ulli vadai - deep fried shallot fritters, a very nice Kerala-style chicken that had been marinated with spices and deep fried, and a Central Travancore speciality, meat ularthiathu. This is usually made with beef but Chef Gourab had made it with mutton. The flavours were spot on, the tender cubes of meat took on a dark hue after being slow cooked, almost roasted, on a low fire and it was garnished with curry leaves and fried coconut slices. The main courses had been set up on the buffet counters, though we were served at the table. Vegetarians can rejoice - plenty of choices. There was snake gourd peera, cooked with grated coconut, parippu kuttan - a mash of lentils and mixed vegetables, avial - a mix of vegetables cooked with ground coconut and yoghurt as well as puliserry - a yellow, deliciously tangy yoghurt and coconut gravy. To add to the tang, pieces of raw mangoes had been cooked along. 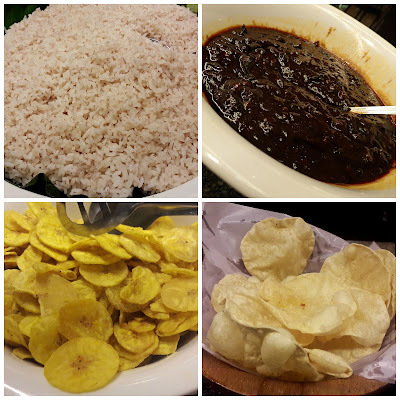 All these are served with rice and if you want to eat like the Malayalis, the rice has to be the fat-grained red rice variety. 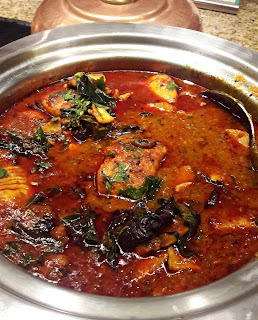 For the non vegetarians, there was the Kerala favourite, meen vattichathu - seer fish cooked in a deadly red gravy, but no, not very spicy. Fish cooked this way is another Central Travancore specialty, I so missed the mashed tapioca that it is always served with. There was also mutton kurumilagu ittathu - literally translated as 'pepper put into mutton'... or perhaps the reverse! Whatever the translation, it was delicious. 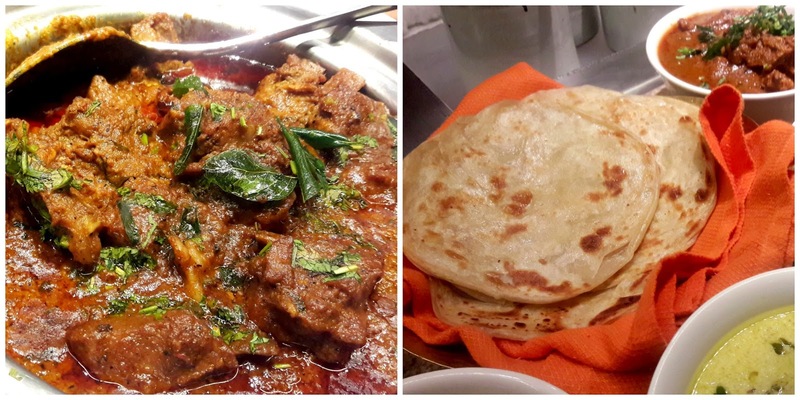 The mutton in the thick gravy was tender and the slight heat from the black peppercorns gave it a wonderfully earthy flavour and aroma, an excellent accompaniment to the not very flaky Malabar paratha. Along with the rice was a bowl of injipulli - a thick, spicy, sweet, sour and tangy sort of chutney made with tamarind paste and ginger. 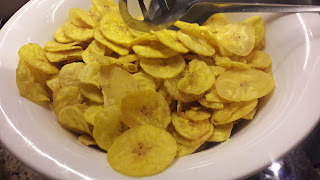 Of course, no Kerala meal is ever complete without banana chips and puffy crisp fried pappadams! We had two desserts - the classic ada prathaman made of rice flakes, jaggery and coconut milk and chakka prathaman - jackfruit payasam. This one is especially for those who love jackfruit. 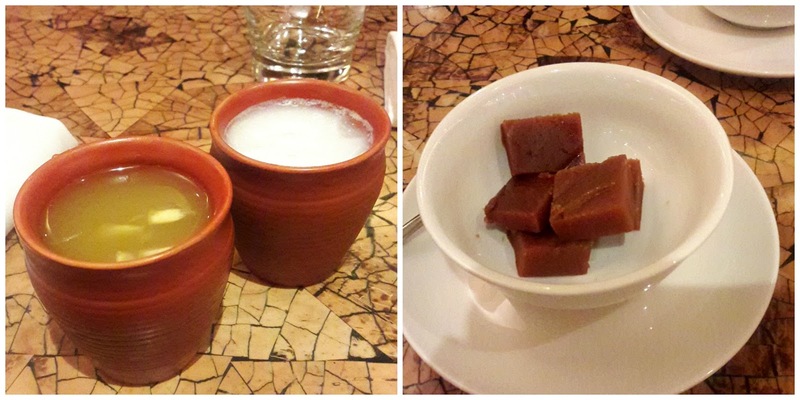 Both were extremely well made and perfectly sweetened. The Kerala Food Festival is on till April 25th, from 6.30 - 11.30 pm and only for dinner. The dinner buffet is priced at 1550/++ and you can have the run of all that is on offer at the restaurant. The Kerala Vegetarian Thali is priced at 1000/++, non veg at 1200/++.